One: set the first beat (internally for swing and also externally for chained modules over a Stop/Start command sequence). This also works in Slave mode and can be used to (re-)synchronize the module chain to an already running clock. Lag: difference to the internal master clock or to the external clock in slave mode. When in the middle position, there is no difference. Moving the fader up delays the clock. Moving it down, shifts the clock earlier than the reference clock. This can be used for musical purposes in order to play „laid-back“ or „in a hurry“ (in relation to another sequence) and also to correct for the summed latency of the whole module chain. 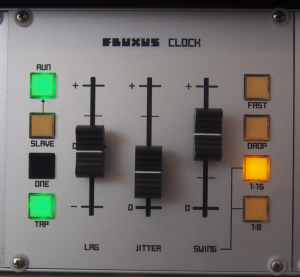 Fast: affects several parameters at once. If this is off (default), a minimum distance between clock events is always maintained. 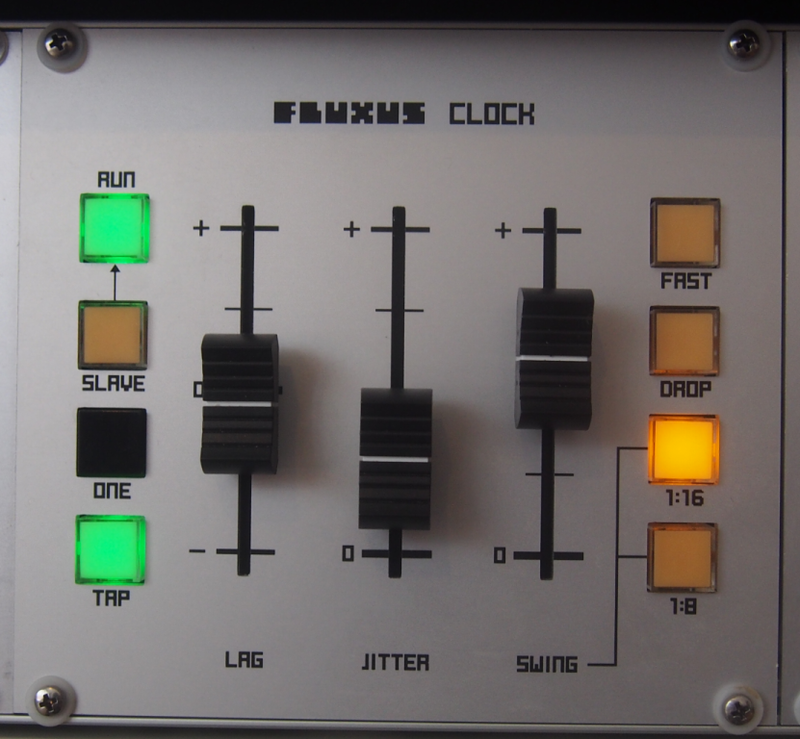 When turned on, the minimum distance between clock events is only limited by the MIDI Serial interface which can lead to problems with early digital equipment loosing synchronization (everything still works fine with all newer equipment we know off including all other Fluxus modules). Also, when this parameter is turned on, changes of the fader values are used directly based on the raw input readings (per default, they are smoothed out).